Back to the subject of this thread: saw a raving review of this on Classicstoday. Anyone knows this recording or this opera? And classicstoday gave it a 10/10. All I know is I want it. This is perhaps Lully's best opera. The Prologue is splendid with the colors of the instruments, the rhythm. The first two acts, however, are heavy with the kind of rhetoric declamation that Lully introduced in French vocal music. But the opera has extraordinary moments: the scene of the Sleep, in the 3rd act, is a model followed by many composers (Rameau, Purcell), and the great tragedy of the 5th act, with Atys murdering Sangaride and then killing himself. In this scenes Lully is at the level of Monteverdi. The interpreters are just acceptable, except the very touching Agnes Mellon in Sangaride and Bernard Deletré, irresistible comedian in the role of the God of the River. 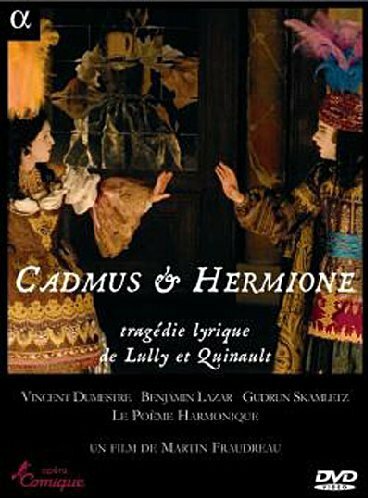 From January 21st on, Lully's "Cadmus et Hermione" will be staged at the Opéra Comique in Paris. Vincent Dumestre and Le Poème Harmonique ( Claire Lefilliatre etc) perform, Benjamin Lazar ( 30) is the director. In this month's "Diapason" he talks enthusiastically about this premiere : Lully's first "tragédie lyrique"! He calls it a "hybrid" work that combines comedy & tragedy,the profane &and the sacred . It will be a grand spectacle ,with a special role for "real" theater machines. No high tech tricks, but handmade contraptions. Lazar and his troupe studied Bacilly's "l'Art de bien chanter" (1668) and "Réflexions critiques" de l'Abbé Du Bos ( early 18th cent;). As for the way singer/actors should move ,he consulted "Sept traités sur le jeu du comedien" ( edit. honoré Champion). Georges Forestier's preface to Racine's "Oeuvres complètes" gave valuable insight into declamation and prosody. The spectacle was meticulously prepared at Royaumont, so that the actor-singers had time to assimilate ( "incarner") this way of performing. Lazar impressed the French public with equally well prepared stagings of Le bourgeois gentilhomme and Landi's Sant'Alessio. "The audience was surprised by this unexpected and singular result : it was "evident". They may have expected a forced, mannered style, but what they saw was fluent, natural." And further : "I refuse the comfort of modernisation. I love this type of poetry and expression.There is no need to extract ( such a work) from its time. Its aura is eternal." 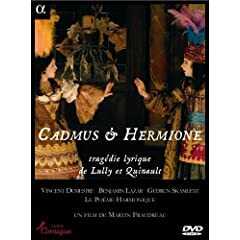 I hope that "Cadmus et Hermione" will be broadcast on France Musique. ! After Paris, the spectacle moves to Rouen (February). I hope that "Cadmus et Hermione" will be broadcast on France Musique. I hope it will be recorded or filmed! I visited the Abbey last year. A magical place! Take the virtual tour ..or go there ,sooner or later. 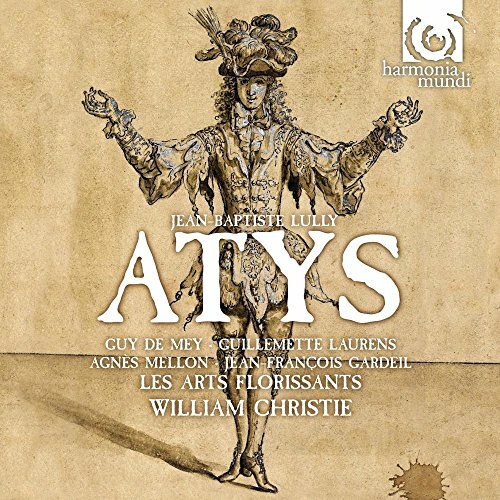 Production project from Théâtre National de l’Opéra-Comique, in coproduction with le Centre de Musique Baroque de Versailles and Royaumont Foundation. - fantasy, that allows the appearance of gods and monsters, and encourages the more spectacular aspects provided by theatre machinery.Training and experimental work at Royaumont will make it possible to constitute a troop of singers, dancers and musicians, and who take all the time needed to explore the ways in which declamatory and other song, gestures and dance may be performed in this lyric tragedy, based on the historical investigative approach to the 17th century being carried out by Le Poème Harmonique with help from the Versailles Baroque Music Centre (Grandes journées Lully, Autumn 2008). The fruits of this multidisciplinary project will be shown to the public at the Opera Comique in Paris in February 2008, followed by performances at Versailles Royal Opera a tour in Autumn 2008. Vincent Dumestre, Benjamin Lazar and Gudrun Skamletz would like the work at Royaumont to provide an opportunity for research and reflection concerning 17th century language, its refined and subtle aspects, its colours and sounds, the way it is declaimed and sung, and its gestures, as well as its choreographic rhetoric along with the marvellous, monstrous and comic vocabularies. The experience gained from Le Bourgeois Gentilhomme (organic links between theatre, music and dance, reconstructed pronunciation, candle-lit staging and so on) will make it possible to take that research further. - from 30 November to 9 December 2007 (tutti). Colorful music, fine recording, very Lully in style. Does anyone like it? I've tried a few time now to get into it, but it just seems like 3 hours of slow whining(without the fun side effects). 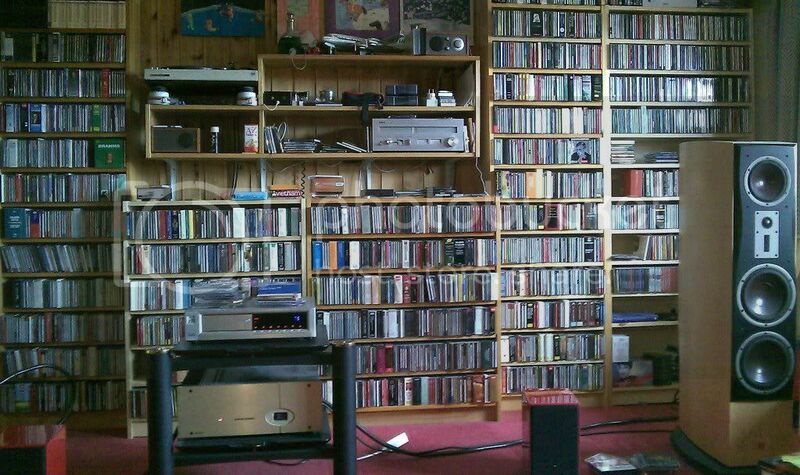 Can someone pick out a few special arias for me to listen to? Maybe you can try the instrumental pieces or arrangements from this repertory instead first. "Concert suites" from Lully, Rameau, Marais etc. sound good. Or if you insist on vocal recordings, I can think at least one now that would suit your need. 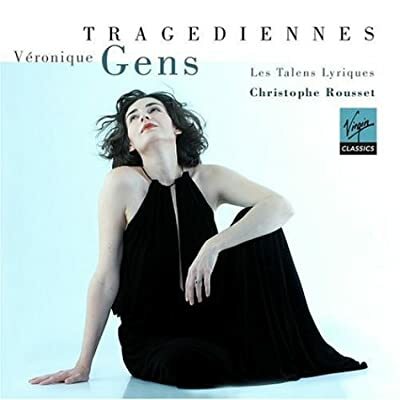 Veronique Gens has a voice that would please most listeners, and the accompaniment from Rousset can't be beat. 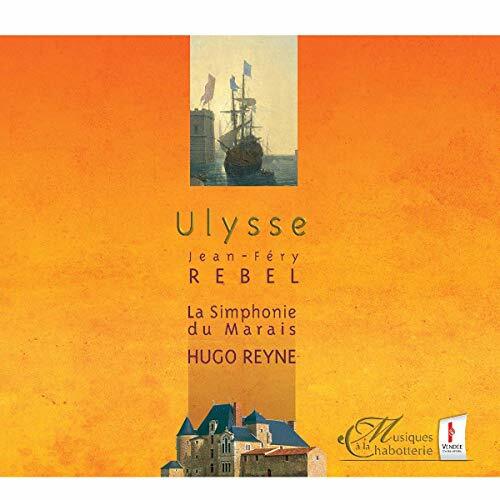 Haha, this cd is the whole reason I wan't to start listening to french baroque opera. I love her! Really I do! Her Handel cantatas are amazing, and her Mozart cd makes me start daydreaming. She is also in Minkowski's recording of Dardanus, but I have trouble getting anything out of it. Slow long arias, that don't seem to stand out 1 from the other. 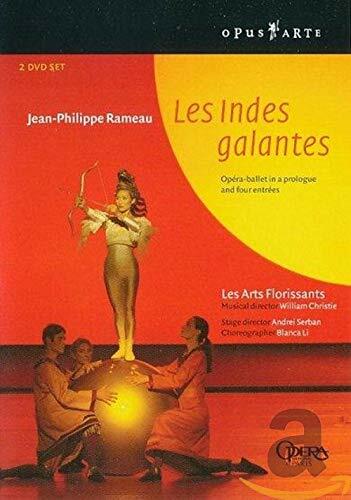 Terrific DVD of Rameau's Les Indes Galantes with Danielle de Niese, Paul Agnew, Patricia Petibon and many others. William Christie conducts. Yes, TERRIFIC! This awesome DVD is responsible for the large part for making my father warm up to classical music. Stop whatever you're doing now, and order one. There are no special features on the disc, no bargain deals to be had. You just pay your money and get the best opera on DVD I've ever seen. Better even than Christie's Les Indes Galantes. Well, OK you can't really compare them. But that's the territory we're talking about. It is stunning. The production is lit with hundreds of tiny living flames, to get the authentic lighting of the period. Not a gimmick, I promise - the character of the lighting throughout is exquisite and a major contributor to the beauty of the production - so delicate and soft. The sets are magic. Sheer magic. The costumes... oh, breathtaking. And then there are the gestures - the carefully rehearsed and executed movements that ought to seem formulaic but which are fantastically expressive. I have never seen hands used to such effect. The way in which Cadmus and Hermione's hands get closer and closer as the opera progresses, but not touching until they're finally united is itself something to be treasured. Andre Morsche, as Cadmus, has a presence the like of which I don't believe I've seen. I can't take my eyes of him whenever he's on stage. And then there's the music. Haunting, magisterial, - a revelation. The closing scenes, with the whole cast on stage, singing together the same passage over and over with variations, is very, very moving. Watching this is as close as you're going to get, ever, to seeing what the Sun King saw. If it was good enough for him, it's good enough for me. Stupendous. Infinitely re-watchable and relistenable. It might make you cry in places - not so much because of events in the plot, but just because of the sheer privilege of being able to sit at home and watch such an unsurpassable work of theatrical/operatic art. You need a copy of this. Dumestre here repeats the success he had with the Moliere/Lully Le Bourgois gentilhomme a few years ago, following pretty much the same recipes stylistically. There is a special feature on that one though, and very good, too. the Moliere/Lully Le Bourgois gentilhomme a few years ago, following pretty much the same recipes stylistically. I've given serious thought to buying that, but when I checked out a few snippets from You tube there seemed to be a good deal of merely spoken dialogue, rather than music. Is it so?